Monk, volunteer recovering from smoke, fumes. ISTANBUL, Turkey (Morning Star News) – An elderly monk is recovering from smoke and toxic fumes he inhaled in an arson attack on a Galilee church yesterday as Israeli police investigate the blaze that caused more that $1 million in damages. 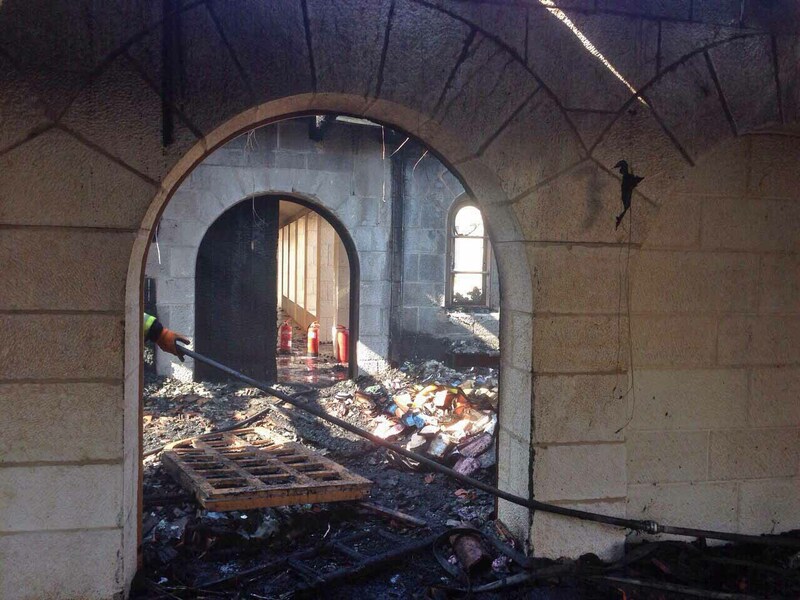 Before dawn on Thursday (June 18) someone set fire to the Church of the Multiplication of the Loaves and Fishes, a Roman Catholic church run by Benedictine monks on the shore of the Sea of Galilee in Tabgha village. Officials have not released the name of the monk, who according to local media reports is 80 years old. Both the monk and a German volunteer at the church required hospitalization. Both suffered from smoke inhalation, with the monk’s injuries appearing to be more serious. No arrests have been in connection with the fire, but 16 Jewish “youths” were held, questioned then released, said police spokeswoman Luba Samri in press statements. According to officials from the Latin Patriarchate of Jerusalem, the damage was substantial. 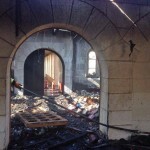 The worship hall sustained minor damage, but the fire gutted one of the rooms in the complex, damaged a book storage room along with the books inside and caused significant damage to offices and an event hall. Grafitti in red paint on an inside wall of one of the buildings read, “The false gods will be eliminated,” apparently a reference to a Jewish liturgical text, though some in Israel translated the marking as “idol worshippers” will be eliminated. The church building was constructed in the 1980s on the site of fourth- and fifth- century churches that commemorated the spot where the New Testament records that Jesus fed 5,000 people with two fish and five loaves of bread. Some Christians believe the miracle happened at the church site. The attack is similar to numerous other arson and vandalism attacks against churches, Christian cemeteries and, more often, other Christian-owned property. Known as “price tag” attacks for the costs they bring to victims, they are carried out by Jewish extremists to punish Christians for their faith, Palestinians for their nationality, or both. Price tag attacks are now common throughout Israel and the Palestinian Territories, with little done to prosecute the perpetrators. This is the second time the church has been attacked. On April 27, 2014, young extremist Jews desecrated crosses and an altar at the site. On May 26, 2014, at the Benedictine Dormition Abbey close to the Upper Room in Jerusalem, someone started a fire during a service officiated by Pope Francis in an adjacent building. The Benedictines of Mount Zion also are constant victims of contempt and violence where they live and work. Monks there see getting spit on and yelled at by yeshiva students and other Orthodox Jews almost as a rite of passage. A lay worker for the Latin Patriarchate of Jersusalem who requested anonymity said the attack has left him feeling apprehensive.